On Saturday November 23rd beginning at 9am, Gravity Brazilian Jiu Jitsu will be hosting its 2nd Annual 24hr Movember Rollathon; a fundraiser for Prostate cancer research and bringing awareness to men's health. The Rollathon, in which at least 2 people will be sparring in Brazilian Jiu Jitsu (BJJ) for 24hrs, will take place at Gravity BJJ in Surrey BC. Black belts are scheduled to arrive throughout the day, in order to help lighten the load on the 150 people expected to attend the event over the twenty-four hours. There will be raffle prizes given and a special Moustache Strut Off Competition in the evening. Many companies have jumped on board to be sponsors for the event. They include Meerkatsu, Gameness, Oss Gear, Fushida, Gi-Soap, Katana BJJ & Tatami Fightwear. 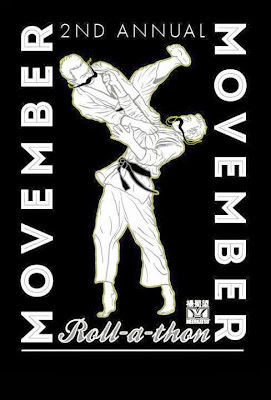 November is a competition filled month: November 23rd will be an opportunity to put the competitions aside, make new friends and come together in the BJJ community. The event is open to all schools and associations.